Kentia Palm - Howea Forsteriana The Kentia is native ot Lord Howe Islands, with arching fronds, slim elegant trunk; it is a very graceful palm. One of the best indoor palms, withstanding low light, dust, central heating, air conditioning and neglect and has been a favorite since Victorian times. Outside it prefers lightly shaded areas with moist and well-dressed soils. Suited to warm temperate and subtropical areas. Older plants can tolerate the occasional frost. 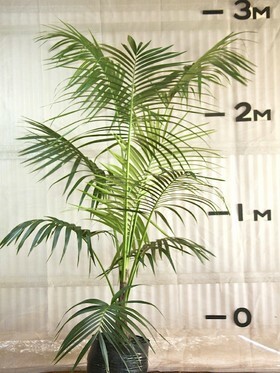 Plants will take around four years to adapt to full sun, growing to 6-18 metres. The palm is unarmed with no spikes or spines. Suitable for Melbourne and Western Sydney as an indoor plant and as a protected outdoor plant with little frost exposure.